Still looking for the right colour scheme for your wedding? We’ve got a classic idea for you: gold and navy blue. Gold has long been associated with luxury for obvious reasons, and what more luxurious occasion is there than your wedding? Gold candelabras, plate chargers, and metallic sparkling ribbons around your flowers would surely transform any venue to a palace for your special day. Not to mention, gold is one of the few colours that flatters every skin type, so if you go with gold bridesmaids gowns, everyone will look stunning! To contrast with all that shimmer, navy blue is a classic combination to use as your “neutral” for balance. Navy blue tablecloths, paper suites in navy with gold script, and navy candles in your gold candelabras. There are even flowers that have pops of navy in the center, called anemone flowers! And let’s not forget how dapper every man looks in a classic tailored navy suit! 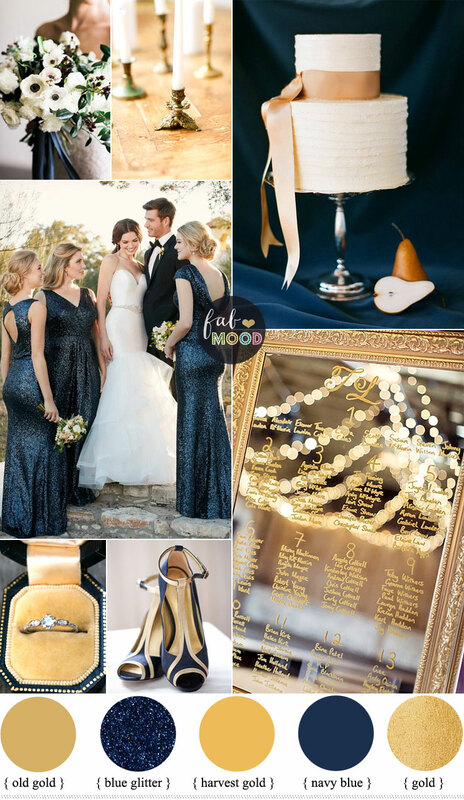 Here are some more beautiful ways to combine gold and navy to create a stunning yet classic wedding look for your big day!